Jomama Jones is the alter ego of New York based theater artist Daniel Alexander Jones, a Penumbra company member in the '90s. Jomama has been touring and releasing albums for years and has performed in the Twin Cities before, but this is my first time experiencing her unique talents. She's a marvelous performer, but her greatest talent is as a storyteller, captivating the audience with stories from her childhood. Stories about science, her beloved but slightly scary Aunt Cleotha from "down South," and her love of Prince as a teenage girl in 1979. 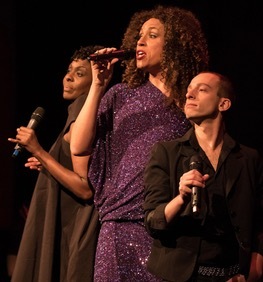 She seamlessly segues from stories to songs, performing original songs (written by Jomama with collaborators Bobby Halvorson and Dylan Meek) with her awesome four-piece band (led by Samora Pinderhughes on piano and featuring some local musicians) and two backup singers. Some songs are fun and upbeat, some are lovely and slow, all have something to say. dresses - each more fabulous than the last (the draped purple sparkly multi-colored number is everything!). She's a master at engaging the audience, including us in her show, and making us feel at ease. There is some audience participation, but not in a scary way, and only because she really wants to connect with the audience, and for us to connect with her and each other. 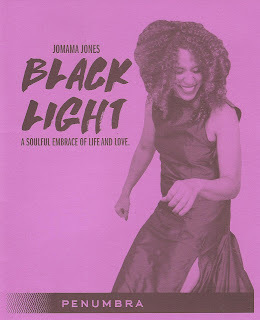 Black Light: A Soulful Embrace of Life and Love continues at Penumbra Theatre through February 12.